More than 100 employees from JetBlue, United, American, and Spirit attended the funeral for Gina Montalto, who was killed in the recent mass shooting in Parkland, Florida, and whose father is a pilot for United. Montalto’s parents set up a GoFundMe to raise money for a scholarship fund in her name focused on secondary education. The response to the shooting, which killed 17 people, has increased the conversation around gun control, as many have called for restricted access to automatic weapons, like the AR-15 rifle that was used in the shooting. 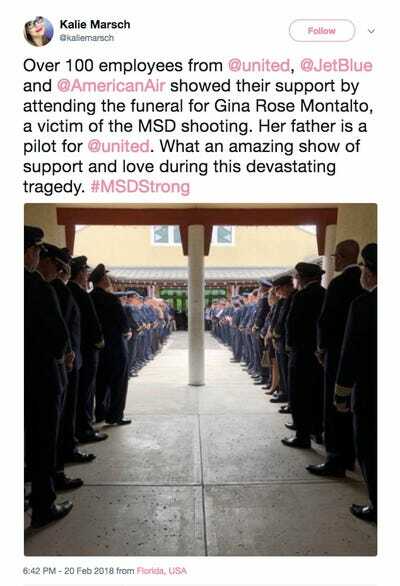 More than 100 employees from JetBlue, United, and other airlines attended the funeral for Gina Rose Montalto – who was killed in the recent mass shooting in Parkland, Florida, and whose father is a pilot for United – according to Dan Petrovich, a United pilot who was in attendance and spoke to Business Insider. Montalto’s parents set up a GoFundMe to raise money for a scholarship fund in her name focused on secondary education. The GoFundMe had raised over $US280,000 of its $US300,000 goal as of Wednesday afternoon. Other members of the airline community showed their support for the family via social media. President Donald Trump has signalled a willingness to promote gun control measures like banning bump stocks, which increase the rate of fire for semiautomatic weapons, and raising the age at which people can legally buy rifles like the AR-15.